The Educators' Domain offers a collection of programming and planning resources for Educators. Editable Learning Story pages for you to use in your end of year portfolio/learning stories. Easy to use-you simply insert your own images and write your own stories. Saving you time to focus on the learning that is happening and your future planning. 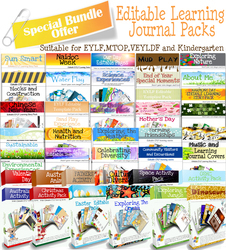 There are many more activity packs at Educators' Domain website. They even offer some freebies and samples on their site. Other packs include: Reconciliation Week, My Family, Naidoc Week, Celebrating Diversity, Our Day- What we Learned Today, Cultural Diversity, Exploring Farms, Sustainable Practice, Learning Journal/Portfolio Covers, Health and Nutrition, About Me, My First Day, Water Play, Creative Art, Science Experiences, Mud Play, St. Patrick's Day, Music and Movement, Exploring Nature, Birthday Editable Pack, Sun Smart, Forming Friendships, Blocks and Construction EVLY Pack, Community Visitors and Excursions, Environmental Experiences, Sand Experiences, End of the Year Special Moments, Chinese New Year, Harmony Day, and probably many more to come. Some of these packs may only holidays celebrated in Australia. Make sure you browse Educators' Domain for more educational resources.